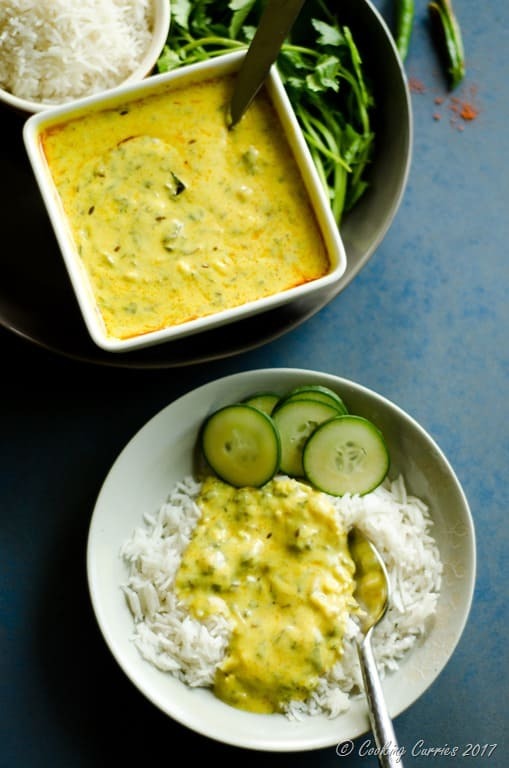 Steamed basmati rice and some hot and creamy Spinach Kadhi is all you need to take you to your favorite warm and fuzzy place. It is one the ultimate food combinations. Kadhi and I have this interesting relationship. As much as I love a good kadhi, and my neighbor makes a killer one, for the longest time, I couldn’t make a decent one myself. I followed several recipes to the dot (which is very unlike me) and still nothing. It was no where close to the delicious, creamy kadhi that my neighbor M makes. Mine was always too thick, never creamy, and never had that nice balanced taste to it. I took it upon me as a challenge. Every time M gives me some of her homemade kadhi whenever she makes it, I savor every spoonful trying to figure out how it tasted the way it tasted. I even asked M for tips and tricks. I always though kadhi was a quick easy recipe, more like the Southern Indian counterpart of Mor Kuzhambu / Pulisseri – like this Chembu Moru Curry or Mambazha Pulisseri. But kadhi takes a little bit more effort and precision. 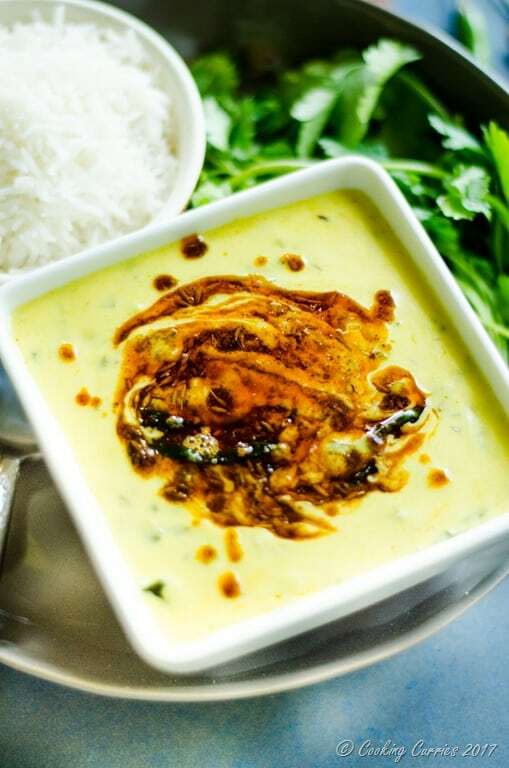 The ratio of besan / chickpea flour to yogurt, the sourness of the yogurt, how long you let it simmer – all this dictates how good a kadhi can get. 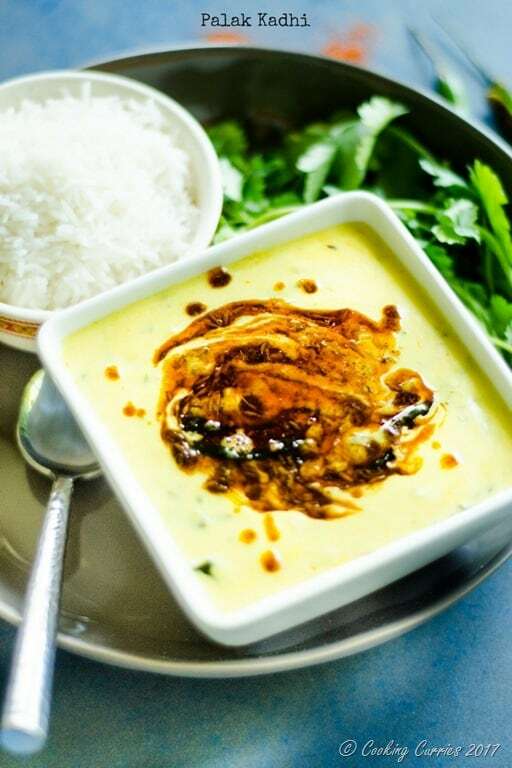 The most common kadhi is Kadhi Pakoda – Kadhi with fried besan dumplings. I do make that quite a bit but to try and avoid all that deep frying, I have been trying other kadhi recipes. 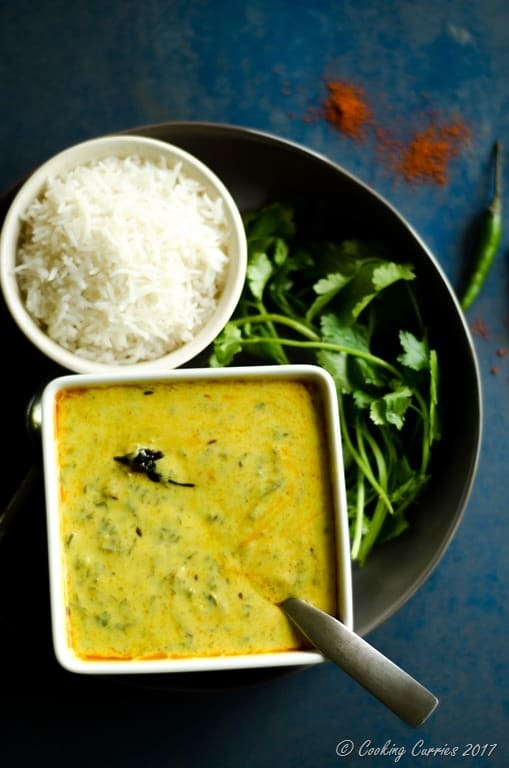 This Palak Kadhi with spinach in it, requires no deep frying and your greens intake for the day is taken care of as well! I will update here once I get the Kadhi Pakora recipe up. 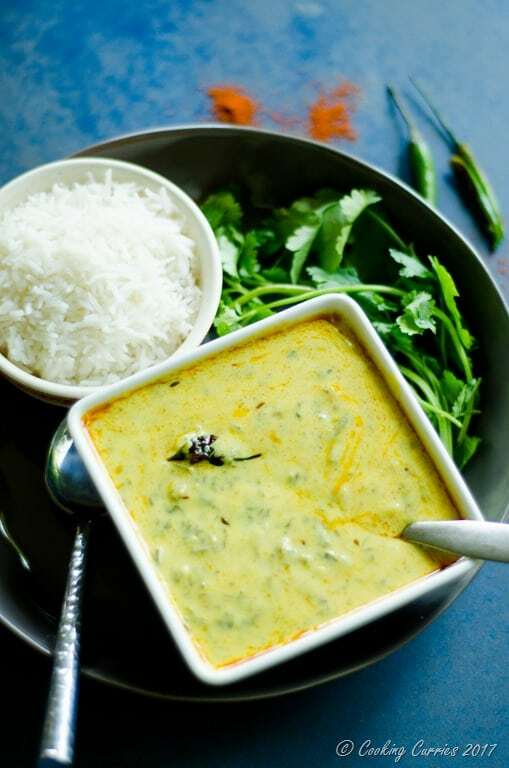 For now, enjoy this creamy Palak Kadhi. Whisk together the yogurt, besan, turmeric powder and red chilli powder to a smooth batter. Heat the oil in a kadhai and add the asafetida to it. Over medium heat, pour in the yogurt batter and keep whisking. Whisking ensures that the sudden heat does not separate the yogurt. Keep cooking it on medium low heat and whisking every minute or so, till small bubbles start forming on top. Add water to thin the curry out and keep cooking it, whisking every now and then, for about 30 mins. Now add the chopped spinach and salt, mix well and cook for 5 mins or so, till the spinach wilts. In a smaller pan, heat the oil and add the cumin seeds to it. Once they sizzle. Add the garlic slices. Reduce heat to medium high. Once the garlic starts to crisp up, add the red chilli powder and pour this over the kadhi immediately. If you keep the red chilli powder in the hot oil for long time, it will burn. Love this recipe? PIN IT to your favorite Curry or Indian Food boards to save for later! Find me on Pinterest for more such great recipes.